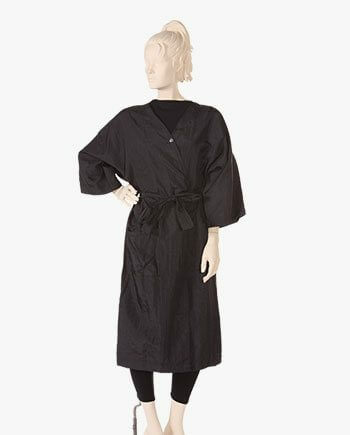 Salon client gown kimono style in 100% lightweight Antron Crinkled Nylon fabric in black. Water, stain and color resistant. Fashionable yet functionable one size fits most. Top of the line fabric and quality workmanship. Our black client gown is the best in the industry! Featuring 100% lightweight Antron Crinkle Nylon fabric that is water and stain resistant and a favorite best seller. This professional gown is full sized to fit most to all of your clients. This designer gown has 3/4 length sleeves with 1 top snap and a belt sewn securely into the back seam so it will not come off in the wash. I love this robe. It is so soft that I feel like wearing it all day. Wonderful product! Very good. Perfect for my salon clients. I ordered 9 on them. Highly recommended! !